DIRECTIONS: NJ-4 E to Queen Anne Rd ramp towards Ridgefield Park/Bergenfield. Turn right onto Queen Anne Rd and stay straight for approximately .6 miles. Turn left onto Court St. DESCRIPTION: Huge and brand new inclusive playground with so many great things to do, too many to even mention! 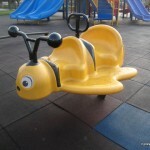 This inclusive playground is full of ramps and playthings making it easy to maneuver. 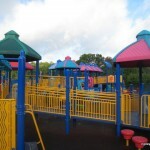 The structure is great for toddlers with all of the ramps and rubber square surface. All of the playthings are educational based with musical keyboards, sign language lessons, fire safety tips, and so much more. 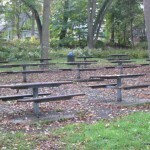 PICNICKING: A gazebo like shelter four two tables. 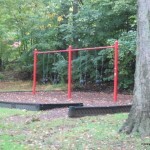 OTHER COOL STUFF: There is another area next to playground with just climbing equipment. 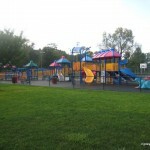 Richard Rodda Community Center is one block over with a 4 star playground on Palisade Ave and Colonial Ct.
MAKE A DAY OF IT: Take a cool trip to Bischoff’s Ice Cream store located at 165 Cedar Lane. Bischoff’s is an old fashioned ice cream parlor with the best ice cream and shakes in the area. With my kids in school and an increasingly active baby, it has been a challenge to leave our surrounding area. I’m even having a tough time just keeping up with posting new places that are on email or my camera. This is the reason I am forever grateful for guest pictures and posts for areas that have been geographically difficult for me to visit. Thanks contributors! These beautiful photos were taken by my close chocolatier friend, Dina. As a culinary expert she’ll also be reviewing nearby food establishments that are worth taking the kids to as well. I really look forward to visiting this park which has been recommended several times. It will be in our biggest and best section. 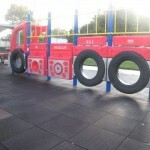 The playground by the basketball courts at Votee. 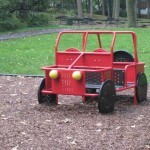 my kids love the “fire truck park” it is a little big and you have to be on the move with them, especially with little ones. 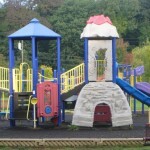 This is a large rec park with three pkayground areas. Yes, the one IS totally enclosed, which is nice, and usually on hot days has an ice cream truck or two next to it. I specifically went here to see the merry go round and see saes. I didnt see any in either of the three play areas. 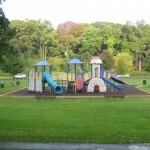 The playground on the south end by the Rec Center is best for very young small children. It isn’t liable to get overrun with the 6+ age kids the way the area at the North end might at peak times. 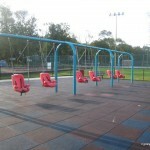 The Northern end park is far more extensive though, and has two sets of swings the smaller set up lacks. 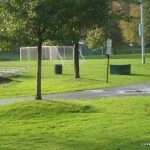 There is also a little known “pee wee” play area near the picnic and bandshell, on the Queen Anne Road side. They do have swings there, and the sprinkler fountain that operates in the summer months for the toddler ages. It’s unfortunate that during busy times, some adults may be less thoughtful and camp out at the few tables for long periods, chatting and texting while their kids run loose by themselves. The park itself is a jewel, a wondrous affirmation that public play spaces can be of quality and add to the enjoyment of local families. the surface of the soccer field at Milton A.
others who use the fields. soil closer to the surface. 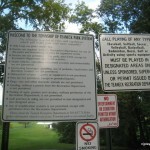 I love this park and have been going since the restriction has been lifted. 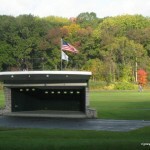 We love this park especially on days when the ground may be a little wet. 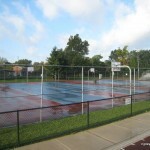 Since the enclosed park features a covered (and soft) surface there’s no risk of damp shoes. There’s not much shade in the encolsed portion however so if you plan to visit on a hot day plan to spend time in other areas of the park.